I'm on my birthday bike trek. I plan to share a summary each day. 1. And so it begins – a four day 300ish mile jaunt to add Michigan to the list of states I’ve ridden in. If memory serves correct, it will be state #25. 2. OK, forget memory, I’ll list the states: Virginia, Maryland, Delaware, West Virginia, New Jersey, Pennsylvania, New York, Connecticut, Maine, Massachusetts, New Hampshire, Ohio, North Carolina, South Carolina, Georgia, Florida, Alabama, California, Oregon, Nevada, Washington, Washington DC (quasi-state), Illinois, Wisconsin, Nevada .. yep, 24 states, 1 district ridden in as of today. 3. The itinerary? DC to South Bend, Indiana on the sleeper car. Ride to Michigan City, which is somehow in Indiana, Wednesday. Then off to St Joseph on Thursday. Milwaukee, via Muskegon and the ferry, on Friday. And ending in Chicago Saturday. 4. The ride from the crib to the Amtrak was rough. Pouring cats and dogs, I arrived at Union Station soaked. I’d ordered some thai food ahead of time and it was ready for me at the station. Amtrak does provide food as part of the sleeper car accommodation, but I always bring my own. I’m a fickle eater and 18 hours to South Bend is a long time. 5. When I pulled into Amtrak, I realized I'd broken a spoke on my real wheel. This is not good. Now to find a repair spot in SOuth Bend. 6. Why Amtrak? The views and the solitude. As a burgeoning writer, the ability to close the door and just watch the world go by is incredibly relaxing. And the views are fantastic. Having ridden the C and O Canal from Cumberland to DC, the train traverses some of the canal. And the views in Point of Rocks, Brunswick, Harper’s Ferry, and Cumberland are worth the cost of the sleeper car ticket. Especially if you can get on the left side of the train. Here's a clip from Harper's Ferry. 7. I plan my trips around major bike races. I find it overly thrilling to ride a tour during a big tour. The only thing better than riding during the tour is being at the tour. My buddy Ian blessed me with this video from stage 9. 8. I’ve had a chance to work on a new playlist. When I get back, it’s the last week of the Tour de France. So we gotta go HARD!!!! Wanna watch the tour, check out this piece I wrote which lists your options. 9. 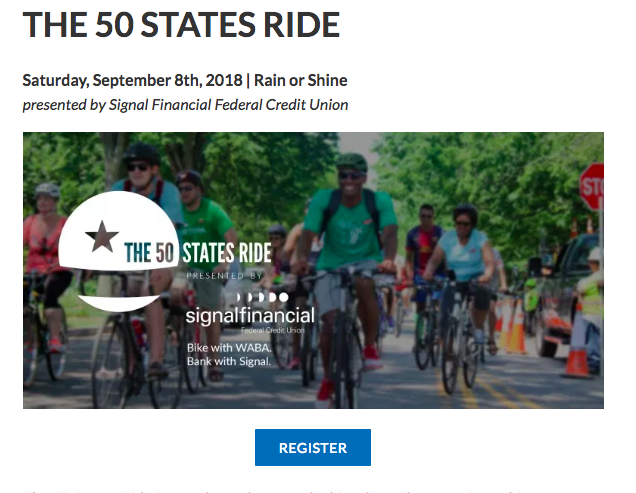 And don't forget the 50 States ride -- REGISTER NOW. It will sell out. I'm finalizing a calendar of indoor and outdoor rides, it's on the do list. Pending how crazy the ride tomorrow is (if I can get this spoke fixed) I'll have it up by Friday. It's number 4 in the writing queue.